What will be the output of the given QBASIC code ? What is the missing number in the given pattern ? Which of the following machines help you in your homework like solving sums? wrong answer. correct answer is A. *1 Terabyte of memory = ______. what is a and d ? 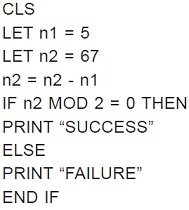 Which of the following programs will print the factors of a number in QBASIC? Self-modifying viruses are designed to avoid detection by antivirus software by changing themselves internally. Which of the following are the two types of self-modifying viruses? In MS-Excel 2010, you cannot ______. Can you really rotate a cell? If yes, with what command? What would be the output of given code in QBASIC? Which of the following Venn diagrams represents the relationship amongst "Hospital, Ward, Operation Theatre"?